Dr. Gregory Bayer, Psychologist, expains how you can help your child. 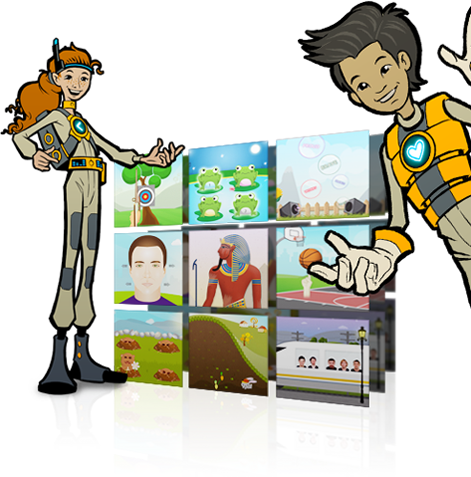 Ongoing access to a validated Assessment of brain effectiveness with personalized Games That Build Skills™ for your child on PoweringUp. Cognitive skills underdeveloped in ADHD can be improved through training. 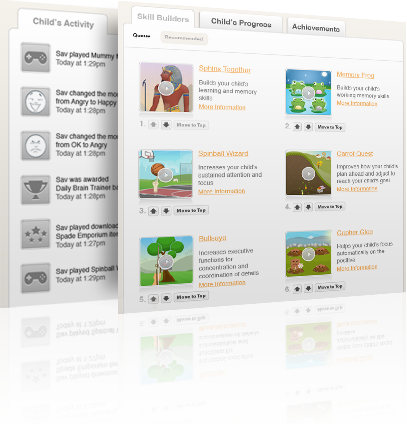 The features of MyBrainSolutions for Parents and PoweringUp.com provide you and your child with the best foundation to strengthen brain health with sustained training over time. 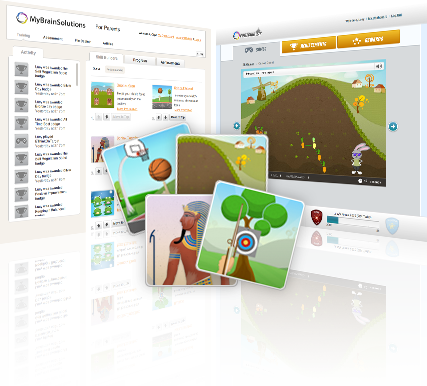 MyBrainSolutions for Parents includes a toolkit that equips you with the resources to better understand and manage ADHD and monitor your child's progress on PoweringUp, which empowers your child with fun skill building games that help strengthen cognitive and emotional abilities. Scientifically designed PoweringUp© skill building games will train and enhance your child’s key cognitive and emotional abilities to improve attention, concentration self-control and emotional resilience. An objective assessment of your child's cognitive capacities is benchmarked to both healthy children and children with diagnosed ADHD. Your child's strengths and limitations are reported in a format you can share with your physician. Actionable recommendations are made based on the results. On your dashboard, you can monitor your child's game-play progress, set goals and rewards for your child, administer the online assessment for your child, and gain valuable insights and recommendations for managing your child's ADHD. MyBrainSolutions for Parents and PoweringUp.com for children is the result of collaboration among a network of international scientists, clinicians and technical professionals. ADHD is a condition that involves disruption to core cognitive capacities that help a child focus, avoid distractions and control impulses. We know these capacities can be measured and trained. Measurement of cognitive capacities and benchmarking to both healthy children and children with diagnosed ADHD is made possible with a rapid and objective assessment for your child through MyBrainSolutions for parents1. 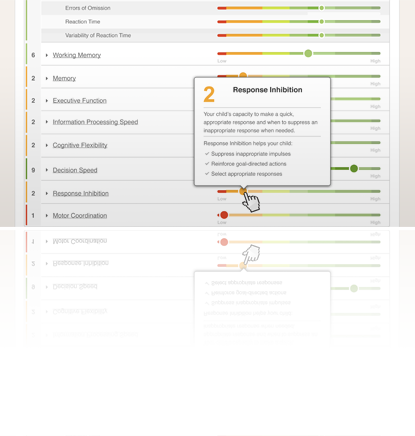 Emerging evidence also suggests that training with computerized games, like those on PoweringUp.com, can strengthen core cognitive and emotional capacities, such as working memory2 and emotion recognition3. This can help remediate the disruptions often observed in children with ADHD, or help to optimize skills in children without diagnosed clinical conditions. Williams LM, Hermens DF, Thein T, Clark CR, Cooper NJ, Clarke SD, Lamb C, Gordon E, Kohn MR (2010). Using brain-based cognitive measures to support clinical decisions in ADHD. Pediatric Neurology, 42, 118-126. Klinberg T, Fernell E, Olesen PJ, Johnson M, Gustafsson P, Dahlstrom K, Gillberg C, Forssberg H, Westerberg H. Computerized Training of Working Memory in Children with ADHD – A Randomized, Controlled Trial. J of Child & Adolescent Psychiatry, 44 (2), 177-186. Williams LM, Hermens DF, Palmer D, Kohn M, Clarke S, Keage H, Clark CR, Gordon E (2008). Misinterpreting emotional expressions in attention-deficit/hyperactivity disorder: Evidence for a neural marker and stimulant effects. Biological Psychiatry, 63(10), 917-926. This can help remediate the disruptions often observed in children with ADHD, or help to optimize skills in children without diagnosed clinical conditions.